Spectacular mountain views and pristine forests away from the normal trekking routes Grade 3* maximum altitude 3820m or 4115m Departs daily from Sep to Nov and Mar to Jun for 2 persons As parts of this area are rarely visited, some trails are in a very poor condition and in places, almost non-existent. Two routes are available, one with a maximum altitude of 3810m and a more difficult route taking you to 4115m. Again, this can be chosen at the time of the trek and will largely depend on your own ability as well as weather conditions. *The route has been graded 3, but you should be aware of the difficulties you can encounter on the trails. Day 01 Hyangja 900m, We start with a 6 hrs drive from Kathmandu to Pokhara stopping for lunch along the way after Pokhara we continue with a short drive to the Tibetan Refugee Camp at Hyangja. Day 02 Armala 1600m, walking approx. 6 hrs. We start for a short distance along the road, before heading across terraced fields, before heading across paddy fields through Suikhet and the Mardi Khola. We cross the river by a footbridge at Lamachok were we stop for lunch; a short steep climb brings us to the Gurung village of Riban. The trail now becomes steeper as it climbs through bamboo groves towards a dominating slab of gray rock and leads onto a ridge and into Rhododendron country. Our campsite is in a small flat field near a single house. Day 03 Lalka 2450m Walking approx. 6 hrs. From a small clearing at Lalghar we continue up through jungle by an ill defined trail to Odane hill. From here we have a superb view of the Annapurna range and Fishtail and more distant views of the Manaslu range to the east and just a glimpse of Dhaulagiri. We follow the crest line with a few ups and downs to our campsite in the forest. Day 05 Katle 3730m. Walking approx. 6 hrs. We continue to climb over steep rocky grassland to Korchon 3680m. The sheer size and beauty of the Annapurna range is breathtaking. We can expect to see plenty of Pheasants along the way. We continue along a thick bamboo covered ridge with plenty of evidence that the Red Panda is a common resident here. Day 06 Pipar Lake 3270m (Lower route) Walking approx. 6 hrs. Most of today's walk involves ups and downs as we descend across several ridges and after crossing a small river climb heavily forested jungle to Pipar Lake. Keep together as traces of a 'path' are sometimes non-existent. Day 08 Pipar: Full day for exploring the surrounding jungle for birds and other wildlife. We should be able to find a large number of birds here and all six species of Himalayan pheasants can be found here. Day 9 Pipar 3270m. (High route) Walking approx. 7hrs. The descent to Pipar, through heavily forested jungle, is steep and tiring. Keep together as traces of a ‘path’ are sometimes non existent. 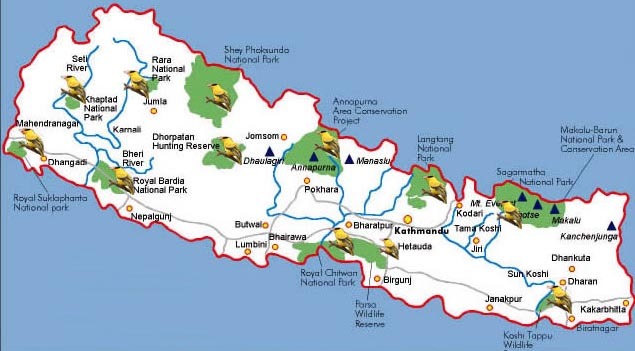 The chances of sighting the Danfe Pheasant (the national bird of Nepal) and other interesting high altitude birds and animals are good. The camp is located at a beautiful site by a small lake. Day 10 Kodi Khola 1400m. Walking approx. 6 hrs. The trail continues steeply downhill, first through open grass covered steep slopes with rock outcrops followed by Rhododendrons and later thick forest. We have lunch at a small level field before continuing down to the Kodi Khola. Day 11 Lahachok 1200m. Walking approx. 5 hrs.A pleasant walk along the valley floor is followed by a short climb to the plateau above the river. A short steep decent brings us to Lamachok and our campsite besides the river. Day 12 Pokhara 1400m. Walking approx. 2 hrs. A short walk to the roadside from where we take a bus to Pokhara, camping at the Tourist camping Ground. Hot showers are available in nearby Hotels. You will also have time to swim in the lake, take a boat out or explore the forest on the southern shore of the Lake. You will also have the opportunity to purchase souvenirs, most of which are made in the Tibetan Refugee Camp and are sold in the campsite by the inhabitants of the camp.